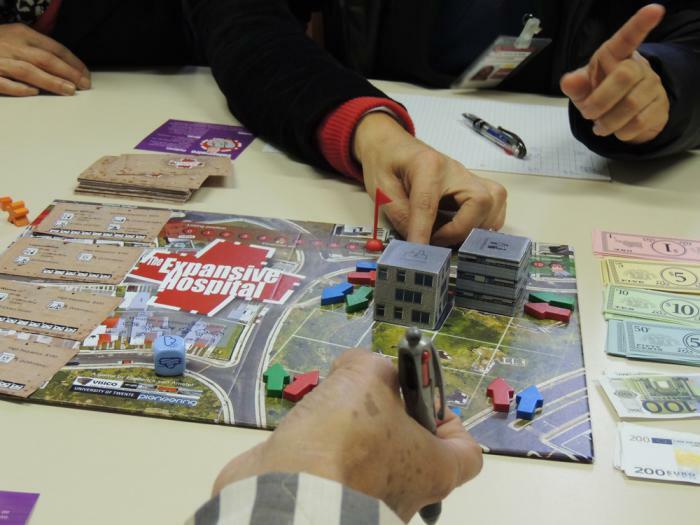 Clinics Hospital of Paraná overcomes conflicts through playing | A board game about conflicts of interests in healthcare design. The Clinics Hospital of Paraná is a major university hospital in Brazil. The Expansive Hospital game was tried out by a team of healthcare professionals who were facing conflicts due to major changes in work organization. The instruments department moved to another building, leaving behind its biggest client: the surgery department. Soon after the move, the departments involved in surgeries could not organized as smoothly as before, when they were close together. The play experience helped the professionals to recognize that the conflicts did not stem from bad personal relationships, but from bad work processes. The lack of communication was a major shortcoming identified. The game contributed to overcome the conflict and stimulate the creation of a new project by the Human Resources department to stimulate collaboration, mediation and support.